The eternal understudy is ready for action as he re-inherits his Melee moveset. 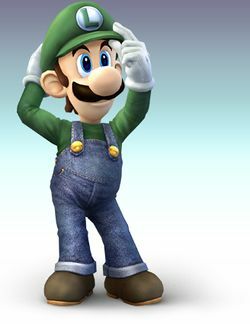 All his life, Luigi has been overshadowed by his elder brother, Mario, but this is no longer the case in Melee and onwards, and it is certainly not the case in Project M. Luigi is a middleweight with an effective moveset, boasting a repertoire of surprisingly very powerful attacks possessing good KO potential. As a result, while slow, Luigi is nonetheless a force to be reckoned with. Luigi's greatest strength, however, is his wavedash, which is the longest in the game. This acts as his primary tool for aiding his approach. Luigi is held back, however, by a below-average recovery due to its predictability as a result of his low fall speed; even with the latter in mind, it is still not very good due to Luigi possessing the lowest air speed in the game. Additionally, Luigi's wavedash being the longest in the game is born from him having the lowest traction, essentially meaning that while Luigi's approach is above-average with wavedashing, it is also far below average without it, so wavedashing is an otherwise vital tool to utilize for Luigi especially. Finally, his floatiness makes him among the easiest characters to KO through the ceiling, meaning that you should always avoid attacks with high vertical knockback, even at mid-high percentages, such as Fox's up smash. This page was last edited on 18 January 2016, at 07:22.